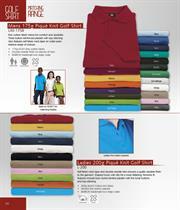 Poly cotton fabric blend for comfort and durable golf shirt. Three button reinforced placket with top-stitching. Also features self-fabric neck tape on collar seam. Massive range of colours. 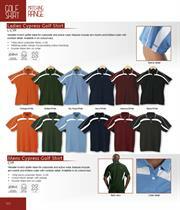 Self-fabric neck tape and double-needle hem ensures a quality durable finish to the golf shirt. Shaped body with vents for a more flattering, feminine fit. 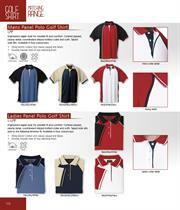 Features include Euro-styled slimline placket with five coordinated buttons and top-stitching on golf shirt. 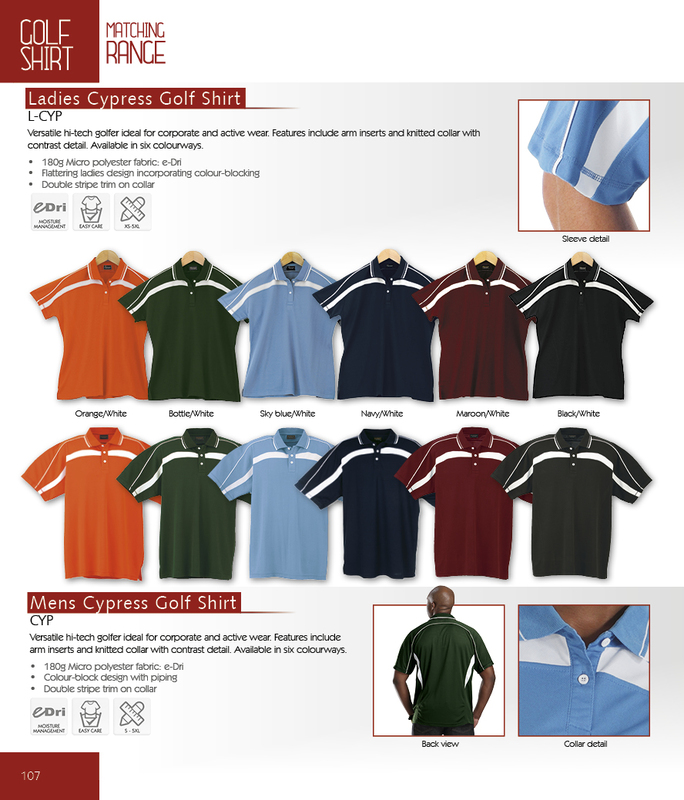 We use top quality combed yarns to create an instant classic golf shirt. 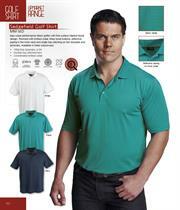 Soft and smooth handle in a cool and comfort-feel fabric. Reinforced placket with top-stitching. Sporty and stylish golf shirt. 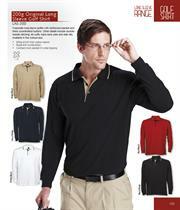 Knitted collar with two-button placket with contrast tipping. Contrast colour carried through to sleeve insert and cuff tipping. 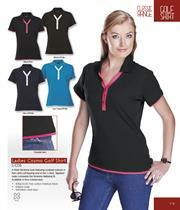 A double contrast twill tape and piping on sleeves and side panel provides a flattering ladies golf shirt. 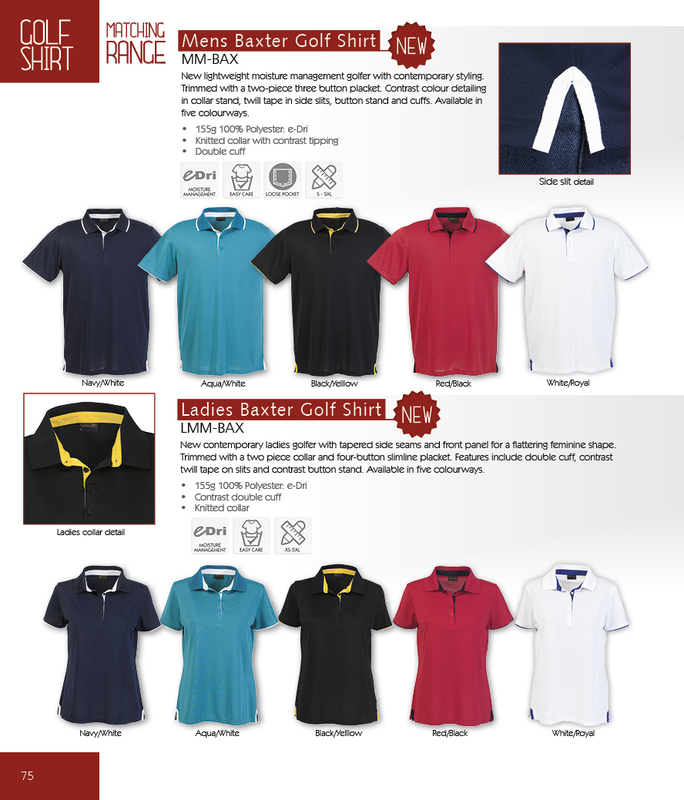 If offers a contrast knitted collar with self-fabric neck tape and V-shaped placket with contrast piping. Great value golf shirt, with contrast button stand and double-stitched hem. 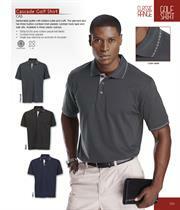 Features include ribbed cuffs and three button placket. Available in seven colours. 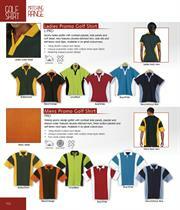 Striking promotional golf shirt available in seven colour combinations. 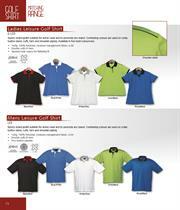 Golf shirt features include contrast placket piping and contrast tipping on collar and cuffs. 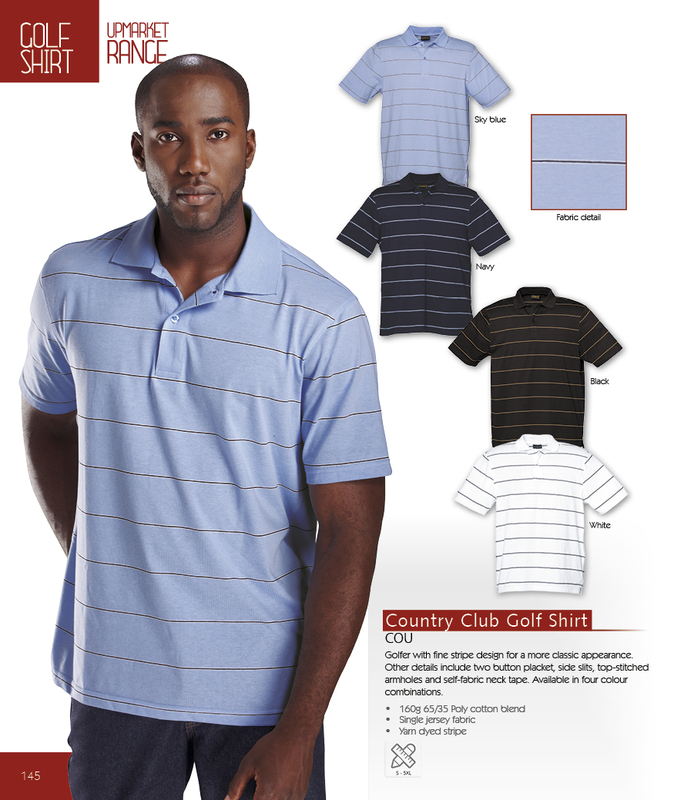 A basic design that is ideal for any promotional event or casual wear. 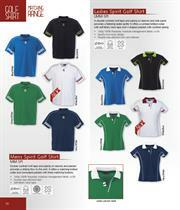 Sporty mens golf shirt in four striking colourways. 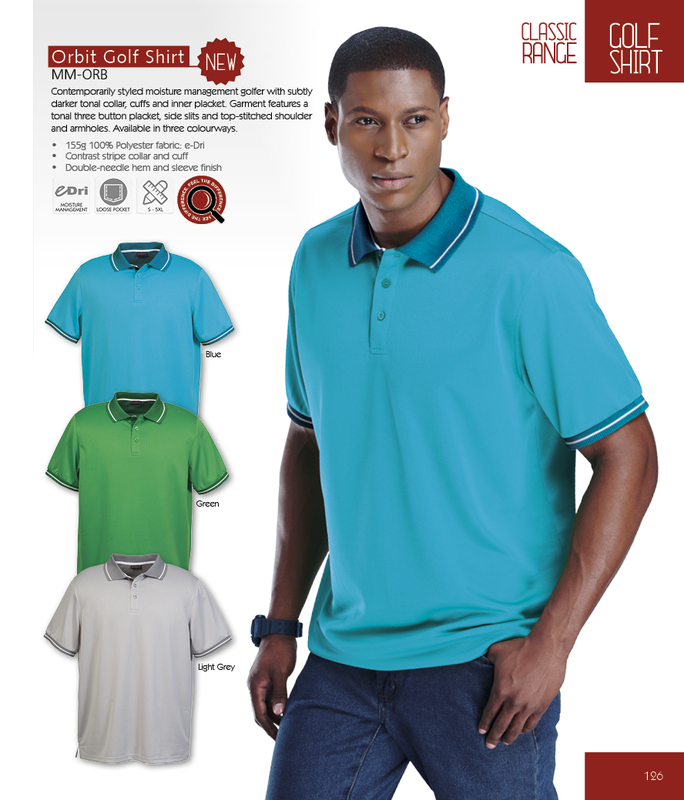 Garment features include contrast colours in a three button placket, contrast taped side slits and knitted collar and cuffs. Sporty styled golf shirt suitable for active wear and to promote any brand. Contrasting colours are used in collar, button stand, cuff, hem and shoulder piping. New lightweight moisture management golf shirt with contemporary styling. Trimmed with a two-piece three button placket. Contrast colour detailing in collar stand, twill tape in side slits, button stand and cuffs. Available in five colourways. 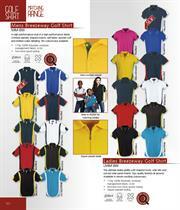 Generous cut golf shirt at an excellent value price. Double-needle finish on sleeves and hem. Self-fabric neck tape, contrasting button-stand and inner placket with three tonal buttons. BARRON's leading sports styling includes shaped shoulder and sleeve colour-blocking. Features back yoke and three button placket. Golf shirts available in a massive range of colourways. 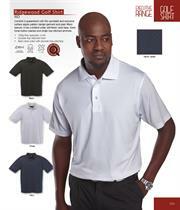 Classic mens golf shirt with lightweight moisture management fabric and subtle top-stitching detail. 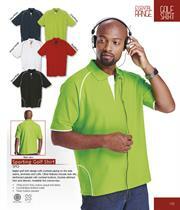 Other features include side panels, top-stitched armhole and three button placket. 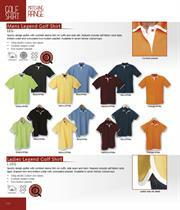 Golf shirt available in four colours. 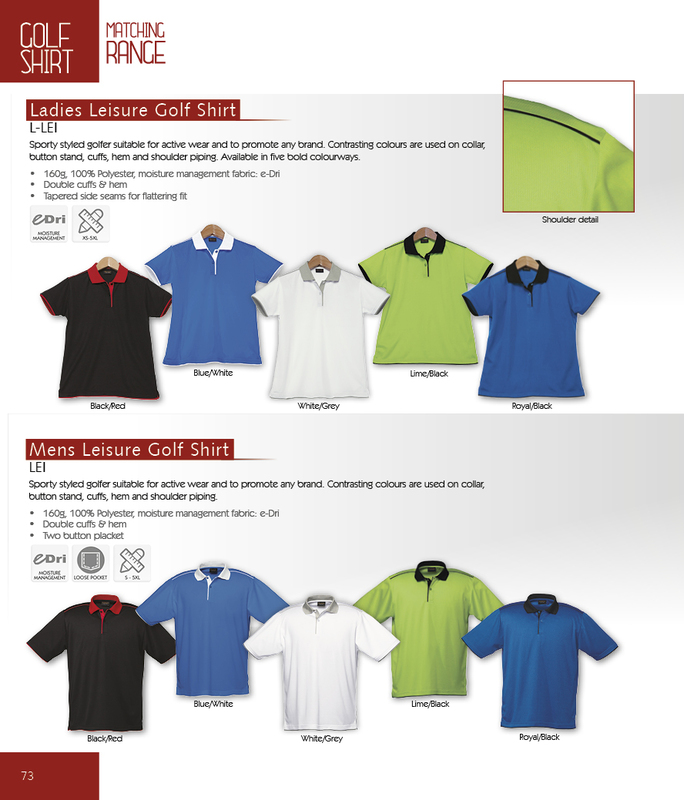 Industry leading hi-tech golf shirt ideal for corporate and active wear. 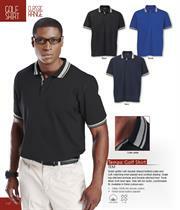 Garment features include contrast piping and arm insert, top-stitched constructed collar and three button placket. The piqué knit moisture management fabric is designed to draw moisture away from the body. 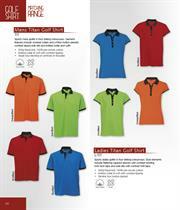 Golf shirt available in four colourways. Innovative block design golf shirt with contrast side panels. 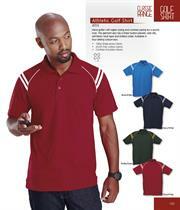 Other features include self-fabric neck tape, shoulder-to-shoulder tape, contrast buttons and placket. Available in four colourways. 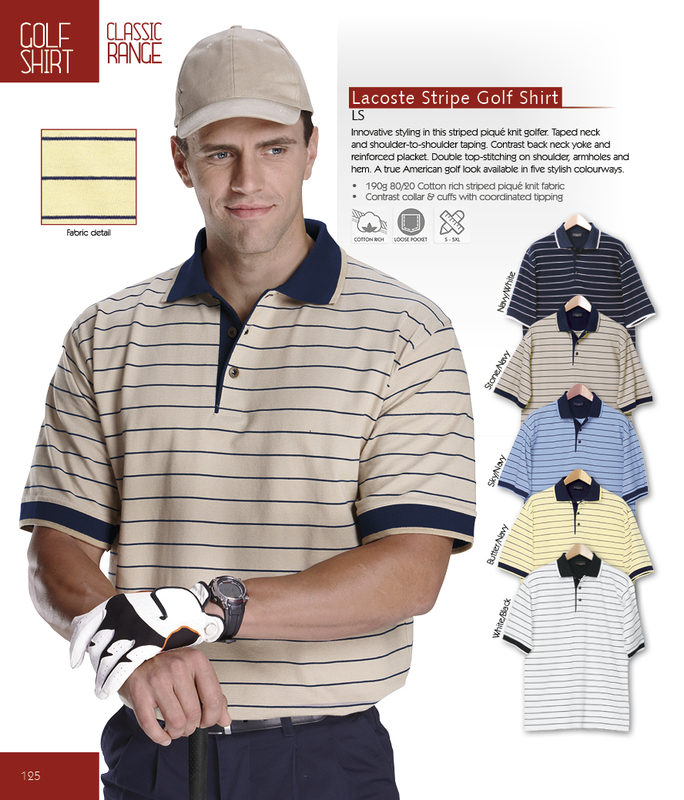 Contrast squared collar golf shirt and colour coordinated striped cuffs. Taped side vents with double stitched hem. 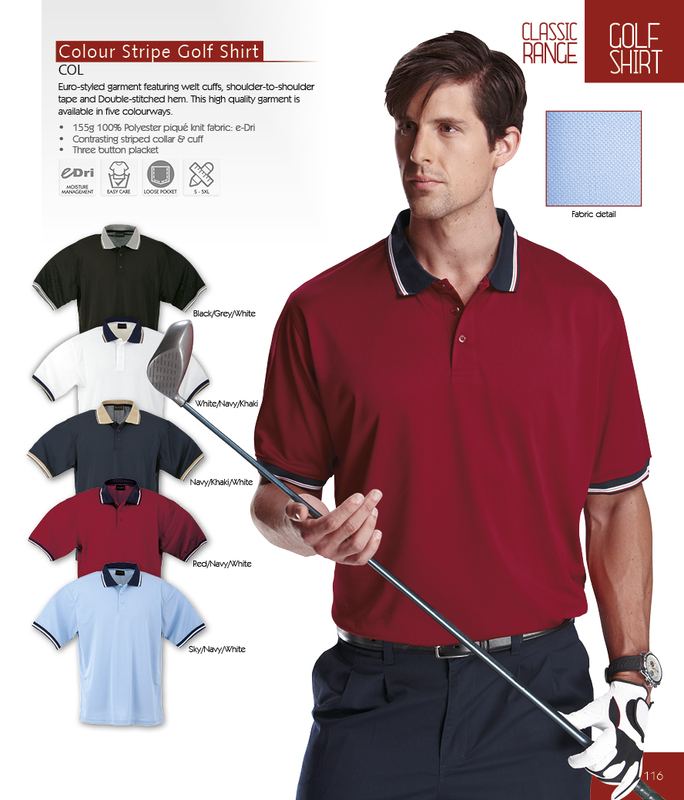 A classic country club look available in five colourways. Contrast piping on the side seam and sleeve of golf shirt give this moisture managed Golf Shirt dynamic, sporting lines. It features a knitted collar with self-fabric neck tape and single top-stitching on armhole and shoulder. Available in seven colourways. 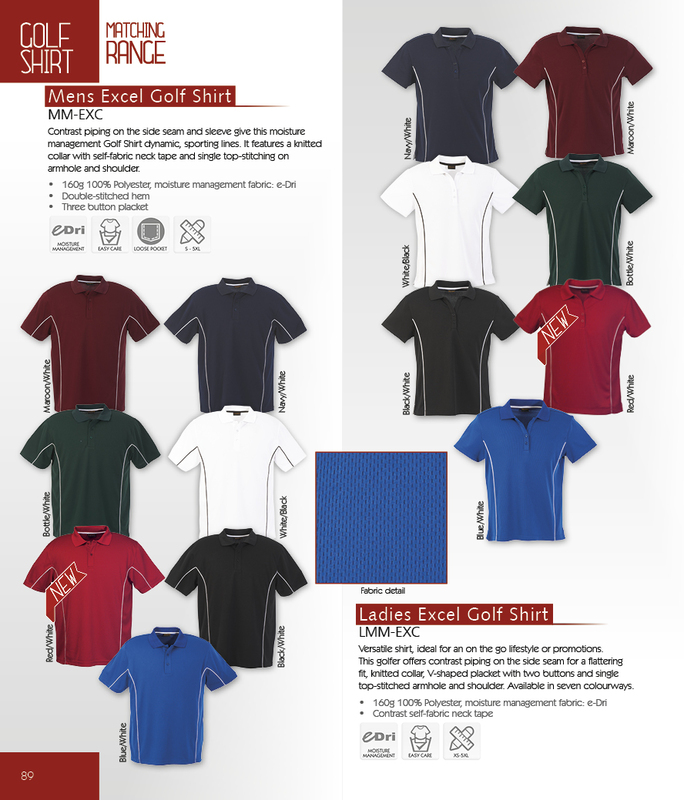 High performance golf shirt with sporty overtones and raglan sleeve styling for fit versatility. Detailed with contrast side and sleeve panels, and contrast overlocking top-stitching. 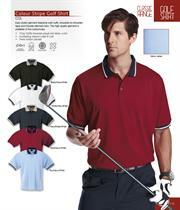 Trims on this golf shirt include tonal two button placket and knitted collar. Available in four colourways. 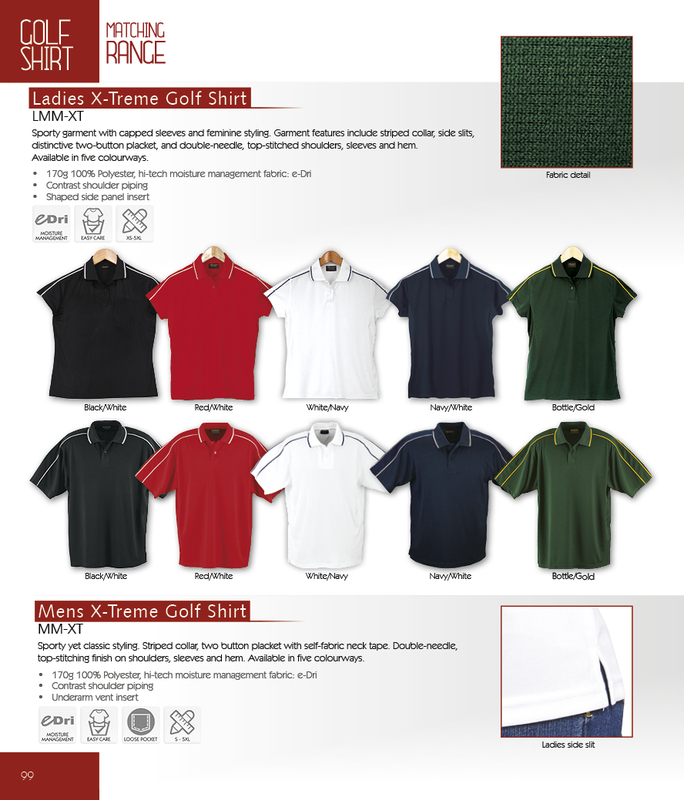 Classic design golf shirt with back neck yoke, double top-stitched armhole and shoulder for a durable and high quality golf shirt. A subtle surface interest textured fabric with innovative cooling technology. Other features of the golf shirt include shoulder-to-shoulder taping, three button placket, jacquard knit trims and side slits. 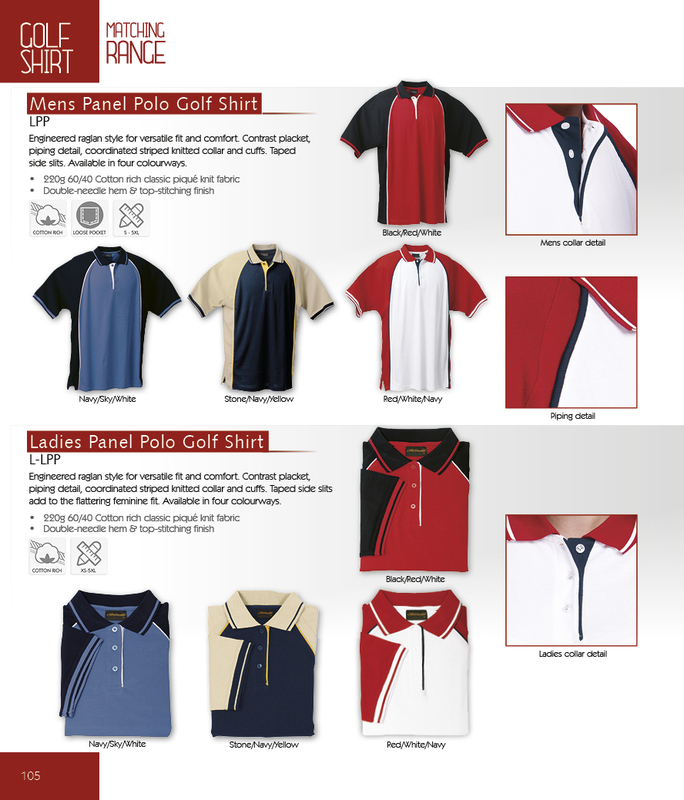 Panel golf shirt with contrast panels and piping. 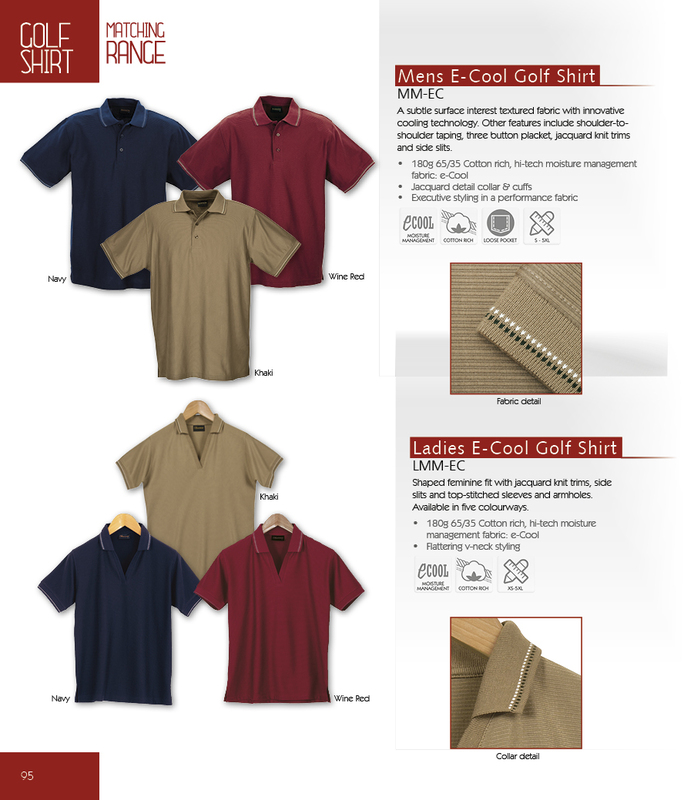 Golf shirt features also include coordinated striped knitted collar, side slits, three button placket with contrast inner. 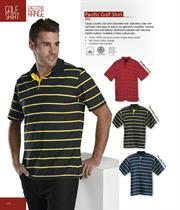 This sporting design is available in four colour combinations. Sporty yet classic golf shirt. Striped collar, two button placket with self-fabric neck tape. Double-needle and top-stitching finish on shoulders, sleeves and hem. Available in five colourways. 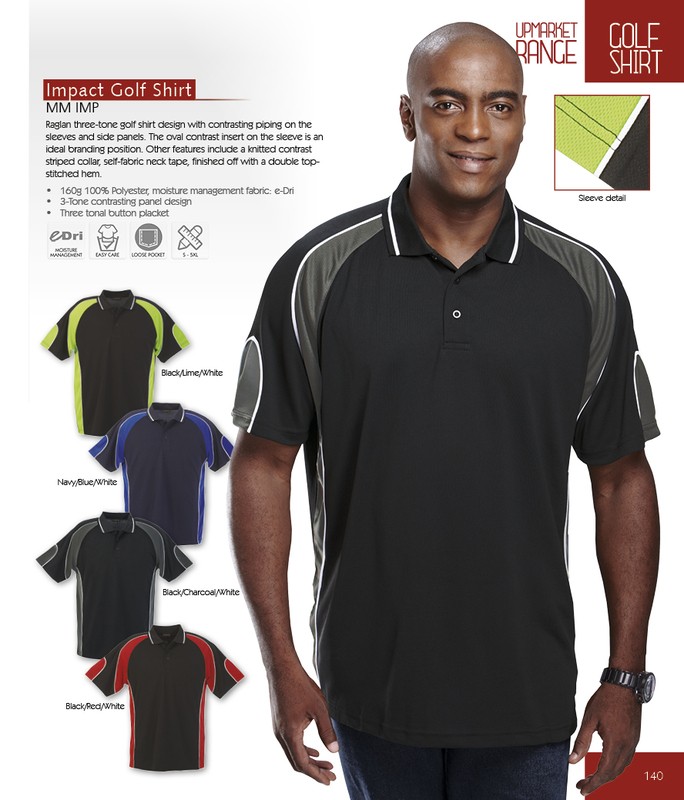 A high performance golf shirt in a high performance fabric. Contrast placket, shaped inserts, self fabric double cuff and knitted collar detailing. Ten colourways available. 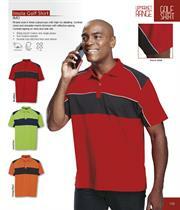 Striking sporty design golf shirt with contrast side panels, placket and striped collar. Features double stitched hem, three button placket and self fabric neck tape. Available in six great colourways. 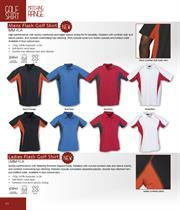 Versatile hi-tech golf shirt ideal for corporate and active wear. Feature include arm inserts and knitted collar with contrast detail. Available in six colourways. 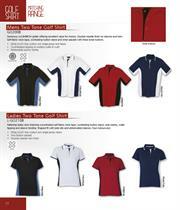 Cutting edge sports styling in a golf shirt suitable for active wear and to promote any brand. Striking use of colour contrasts in collars, button stands and insert panels on shoulders and body. Available in five bold colourways. Sporty design golf shirt with contrast sleeve trim on cuffs and side vents. Features include self fabric neck tape, knitted collar and concealed two-button placket. Available in seven trendy colourways. 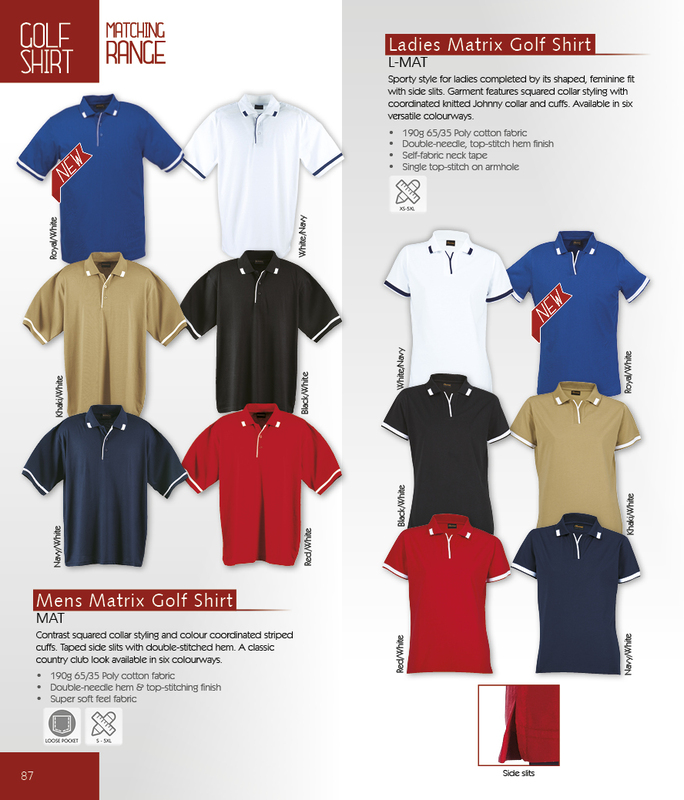 Simply the finest golf shirt in our range. 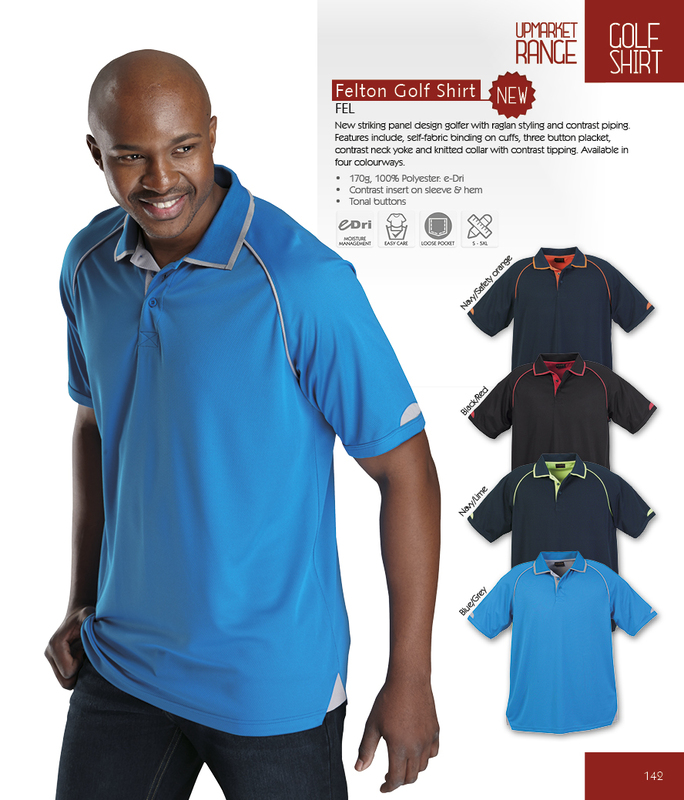 Ultimate feel, finish and comfort in this golf shirt. 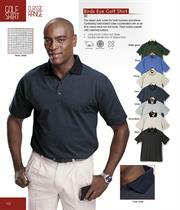 Using the richest mercerised cotton yarns, this golf shirt also features a classic three button placket and side vents. Available in five colours. Coordinated knitted collar and cuffs. A solid colour option in e-Dri moisture management fabric. 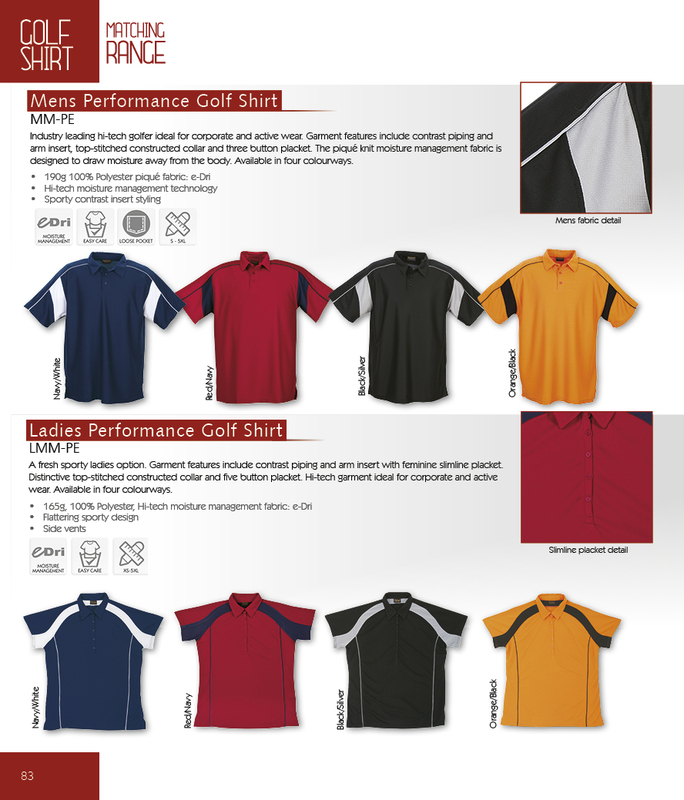 A high performance golf shirt at an attractive price point. Available in five colourways. Euro-styled golf shirt featuring welt cuffs, shoulder-to-shoulder tape and double stitched hem. 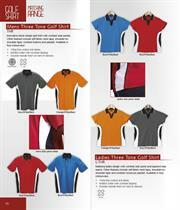 This high quality golf shirt is available in five colourways. Stylish new golf shirt with double striped knitted collar and cuff, matching inner placket and contrast striping. Single top-stitched armhole and double-stitched hem. Tonal fabric twill neck tape. Side slits for stylish, comfortable fit. This golf shirt is available in three colourways. 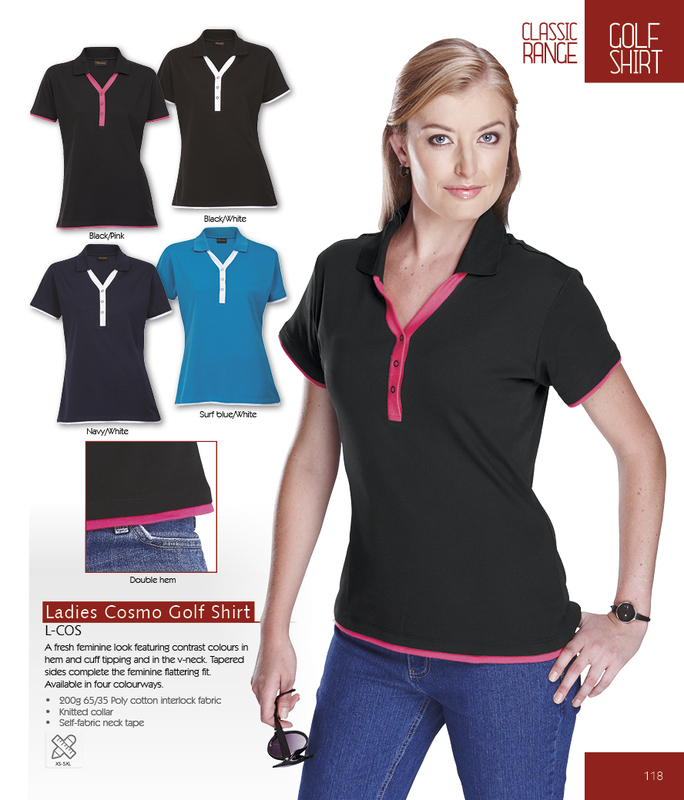 A fresh feminine look featuring contrast colours in hem and cuff tipping and in the v-neck of this golf shirt. Tapered sides complete the feminine flattering fit. 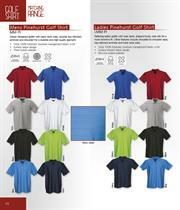 This golf shirt is available in four colourways. 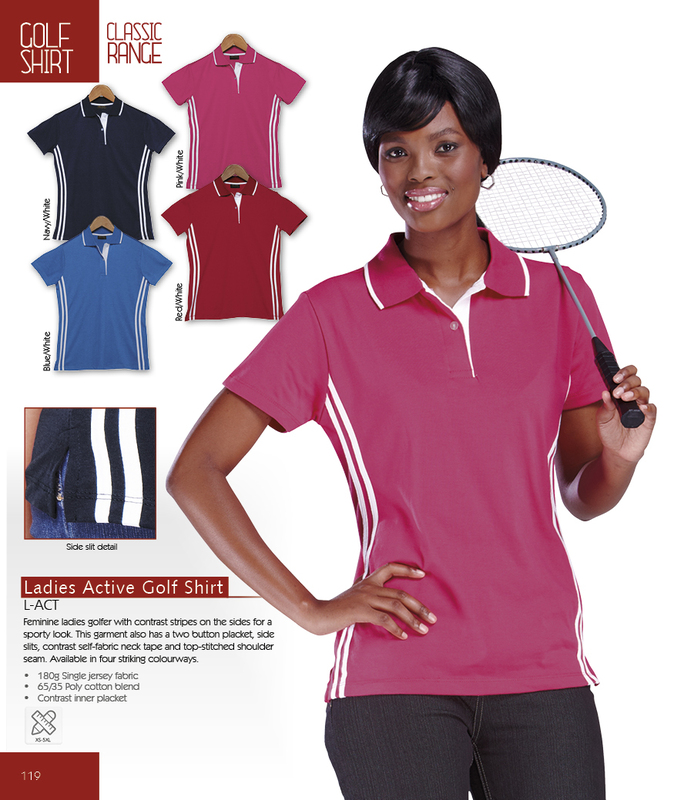 Feminine ladies golf shirt with contrast stripes on the sides for a sporty look. 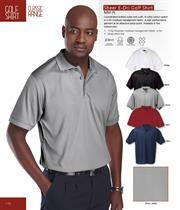 This golf shirt also has a two button placket, side slits, contrast self fabric neck tape and top stitched shoulder seam. Available in four striking colourways. 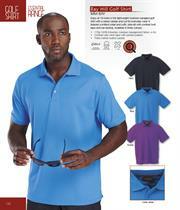 Mens golf shirt with raglan styling and contrast piping for a sporty look. 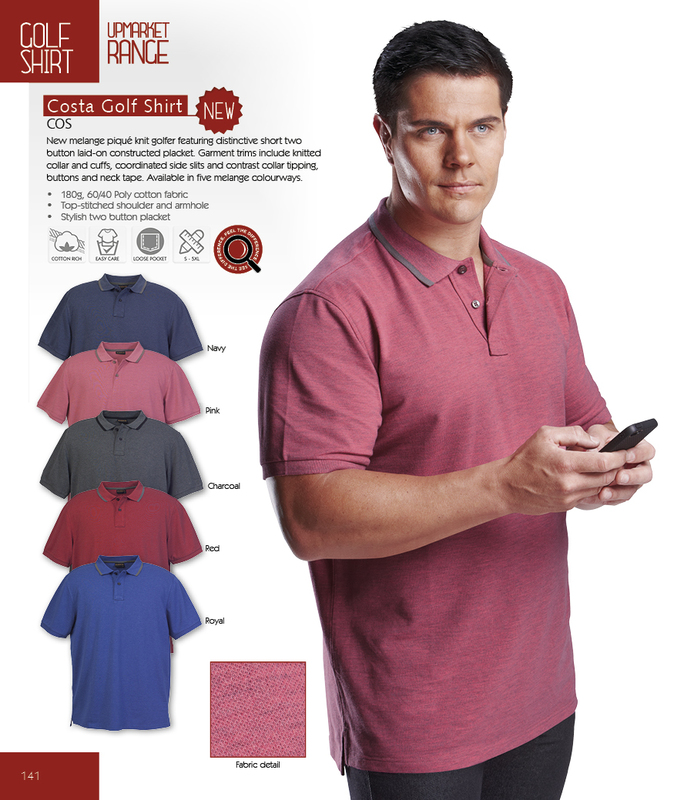 This golf shirt also has a three button placket, side slits, contrast self fabric neck tape and knitted collar. Available in four striking colourways. 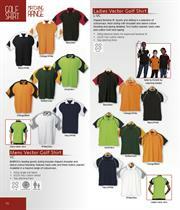 Double-needle stitching on shoulders, armholes, sleeves and hem of golf shirt. Reinforced placket with three tonal buttons. This finish, generous cut and weight is exclusive to BARRON. 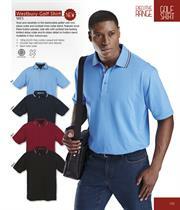 Corporate long sleeve golf shirt with reinforced placket and three coordinated buttons. Other details include double-needle stitching, rib-cuffs, back neck yoke and side vents. This golf shirt is available in five colourways. 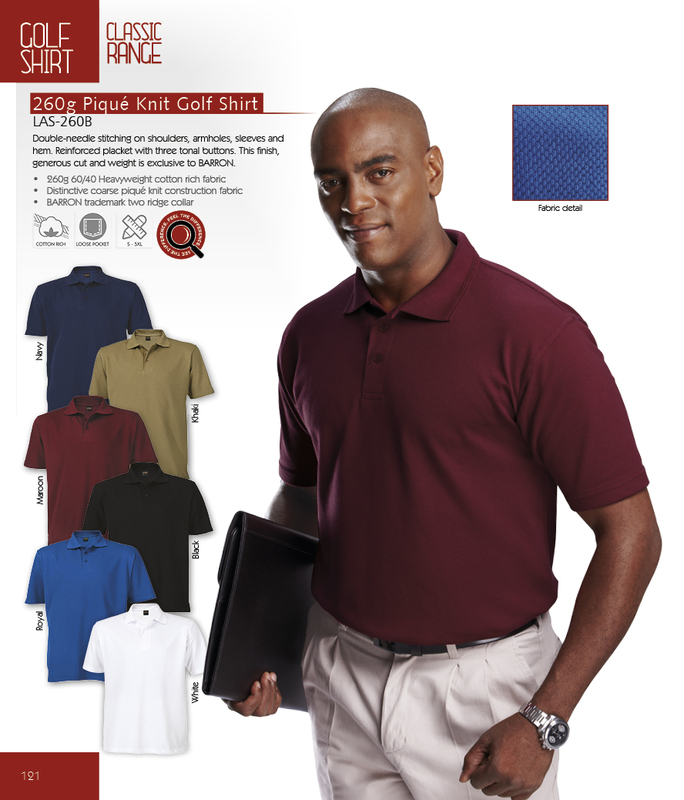 This classic style golf shirt works for both work and leisure. 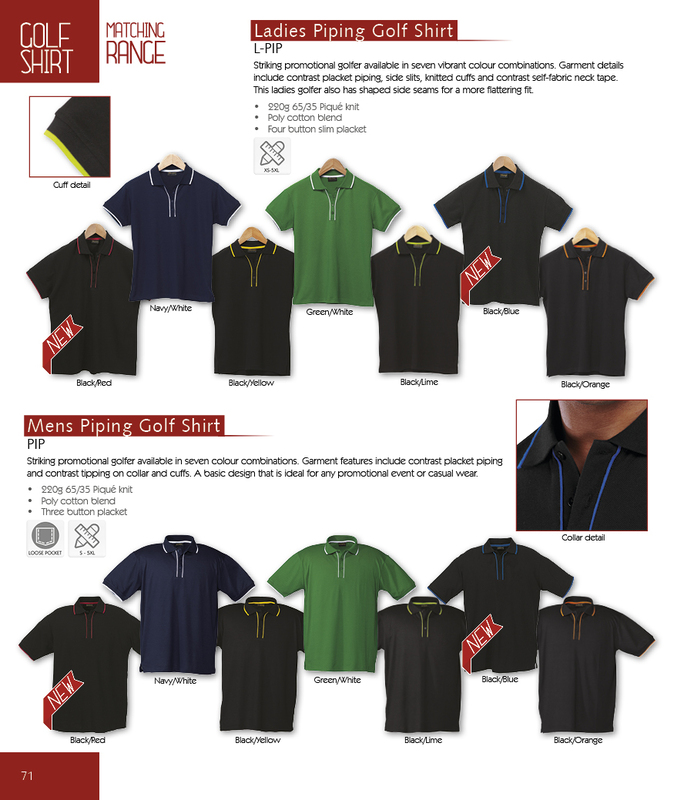 Fashionable golf shirt with knitted collar and cuffs. 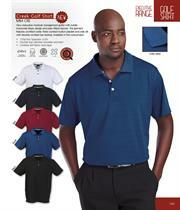 This golf shirt also has three button contrast inner placket, contrast neck tape and side slits. Available in three classic colours. 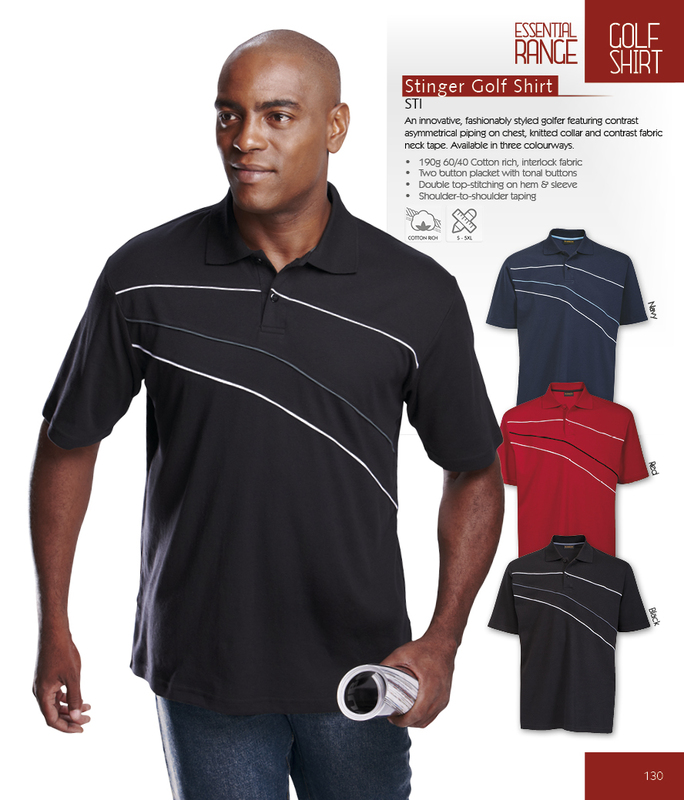 Innovative styling in this striped pique knit golf shirt. Taped neck and shoulder-to-shoulder taping. Contrast back neck yoke and reinforced placket. Double top-stitching on shoulder, armholes and hem. 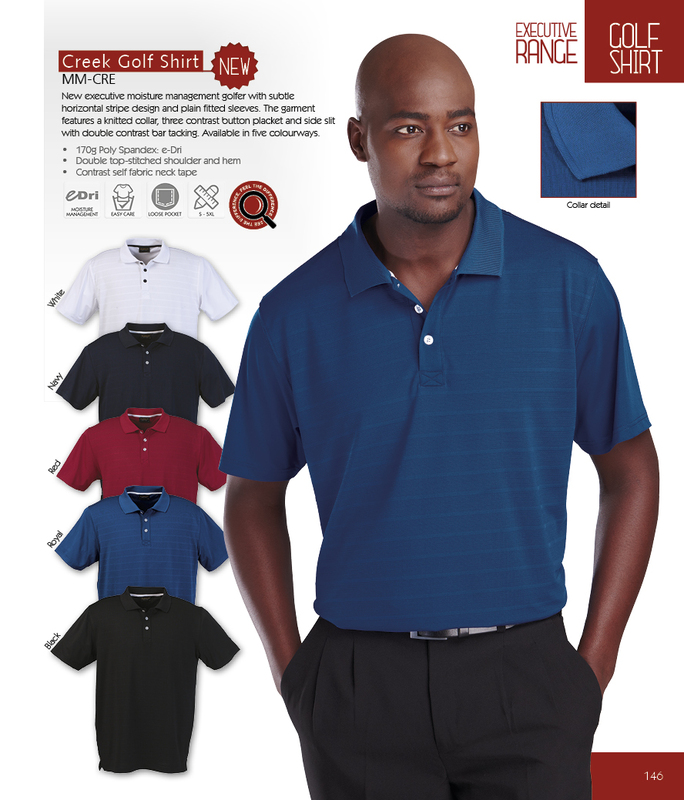 A true American golf look available in five stylish colourways. 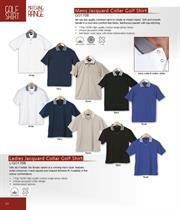 Contemporarily styled moisture management golf shirt with subtly darker tonal collar, cuffs and inner placket. golf shirt features a tonal three button placket, side slits and top-stitched shoulder and armholes. Available in three colourways. 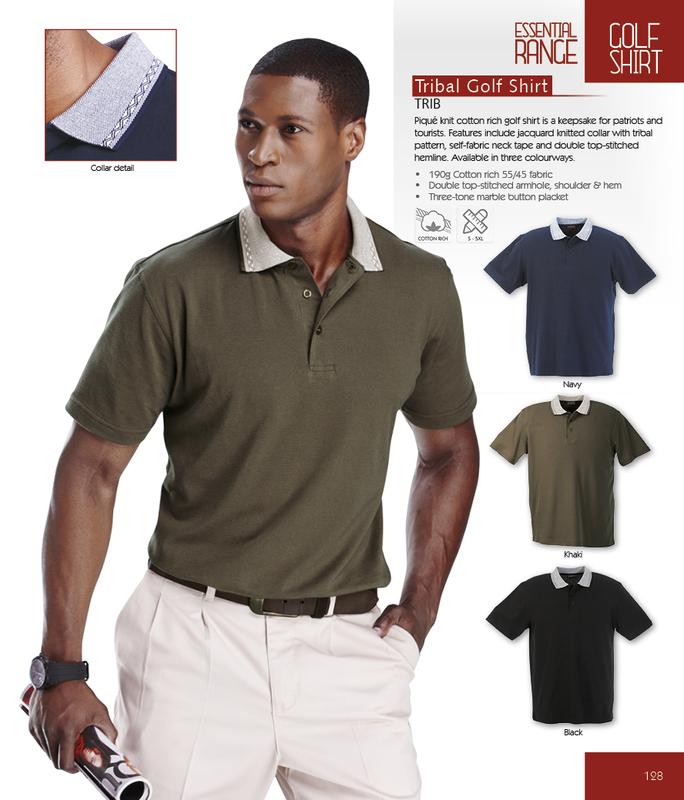 A classic golf shirt featuring a knitted collar with knitted stripe insert across the shoulders and a coordinated stripe on the collar. 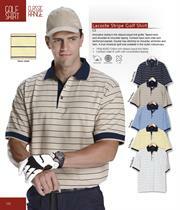 Golf shirt has a contrast fabric neck tape, inner contrast placket and three buttons. Available in three colourways. Pique knit cotton rich golf shirt is a keepsake for patriots and tourists. Features include jacquard knitted collar with tribal pattern, self-fabric neck tape and double top stitched hemline. 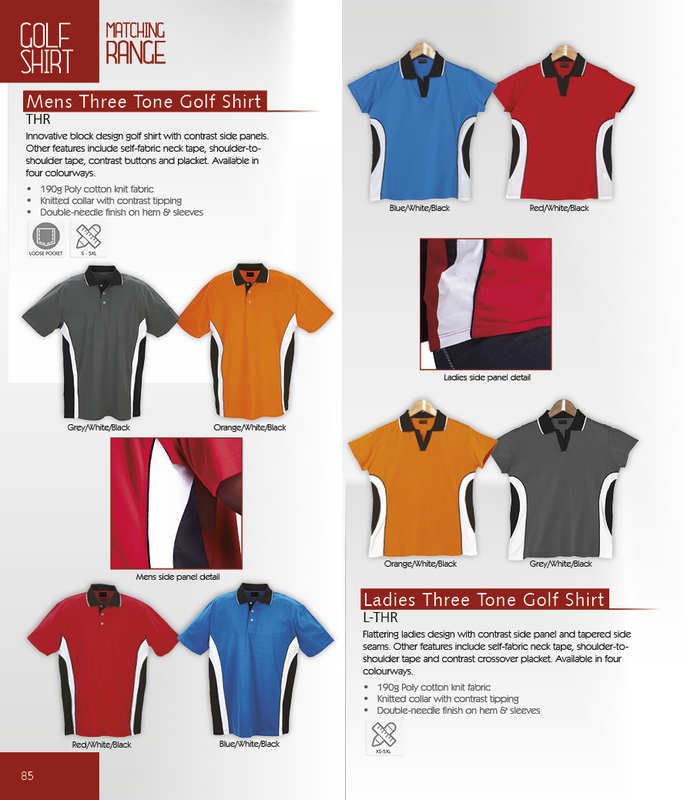 This golf shirt is available in three colourways. 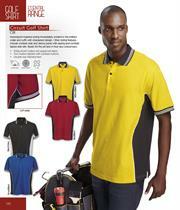 Motorsport-inspired styled golf shirt immediately evident in the knitted collar and cuffs with checkered design. Other styling features of this golf shirt include contrast side and sleeve panel with piping and contrast taped side vents. Ready for the pit lane in four racy colourways. 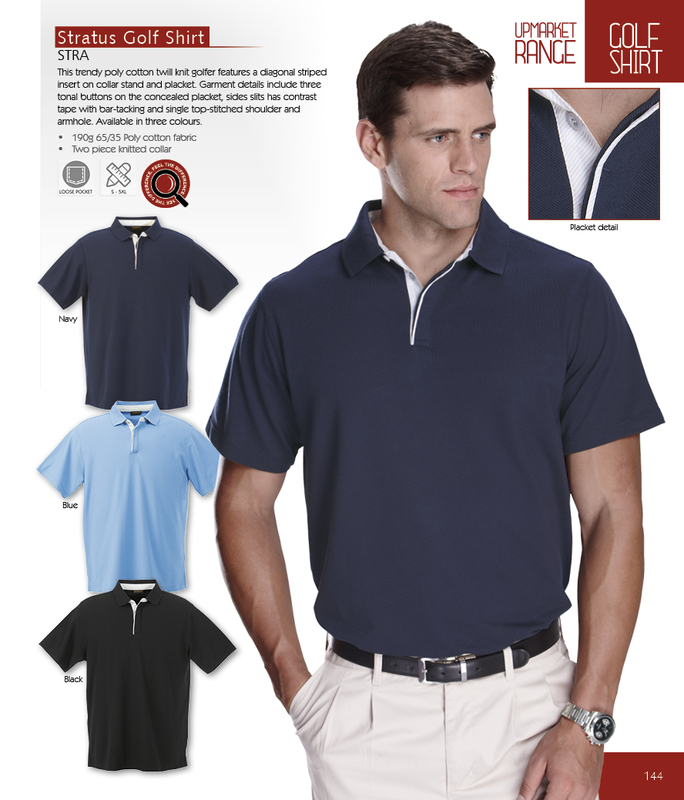 An innovative, fashionably styled golf shirt featuring contrast asymmetrical piping on chest, knitted collar and contrast fabric neck tape. Available in three colourways. Sporty styled golf shirt featuring ridged striped collar, three button placket and self-fabric neck tape. Double-needle and top-stitching finish on shoulders, armholes, sleeves and hem. Available in three colourways. Enjoy all 18-holes in this light weight moisture managed golf shirt with a classic design and cut for everyday wear. It features a knitted collar and cuffs, side-slit with contrast twill tape and bar-tacking. Available in three colourways. Classically styled Piquet knit golf shirt with bold knitted stripe collar and cuff. 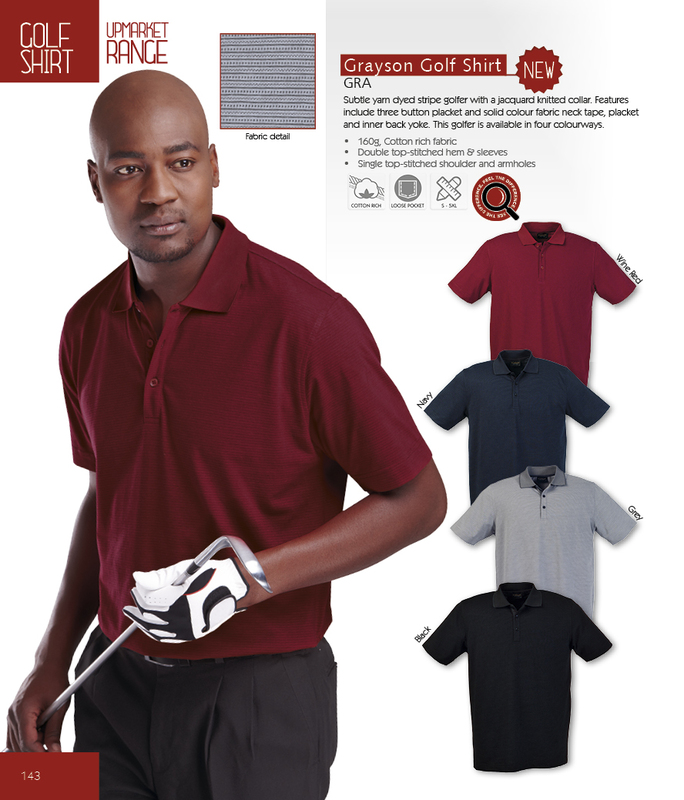 Features include three tonal button placket, contrast neck tape and side slits with contrast twill inner tape. Available in five colourways. 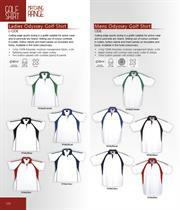 Raglan golf shirt design with contrast piping on the side seams, armholes and cuffs. 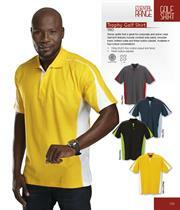 Other features include side slits, reinforced placket with contrast buttons, double-stitched hem and sleeves. Available in five colourways. Self-fabric neck tape, side slits and back neck yoke. Stylish innovative "mini dot" stripe surface interest fabric. This golf shirt is available in three colourways. 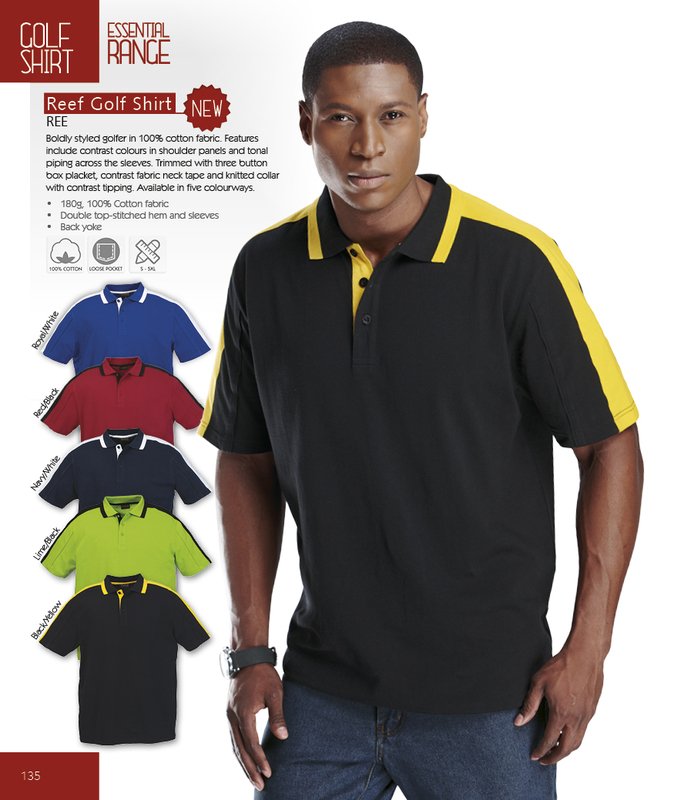 Boldly styled golf shirt in 100% cotton fabric. Features include contrast colours in shoulder panels and tonal piping across the sleeves. 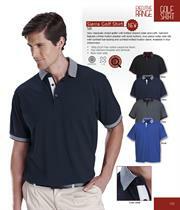 Trimmed with three button box placket, contrast fabric neck tape and knitted collar with contrast tipping. Available in five colourways. 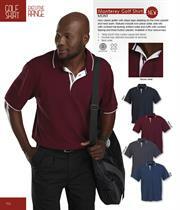 Trendy golf shirt great for corporate and active wear. Golf shirt features include contrast side panel, shoulder insert, knitter collar and three button placket. Available in four colour combinations. 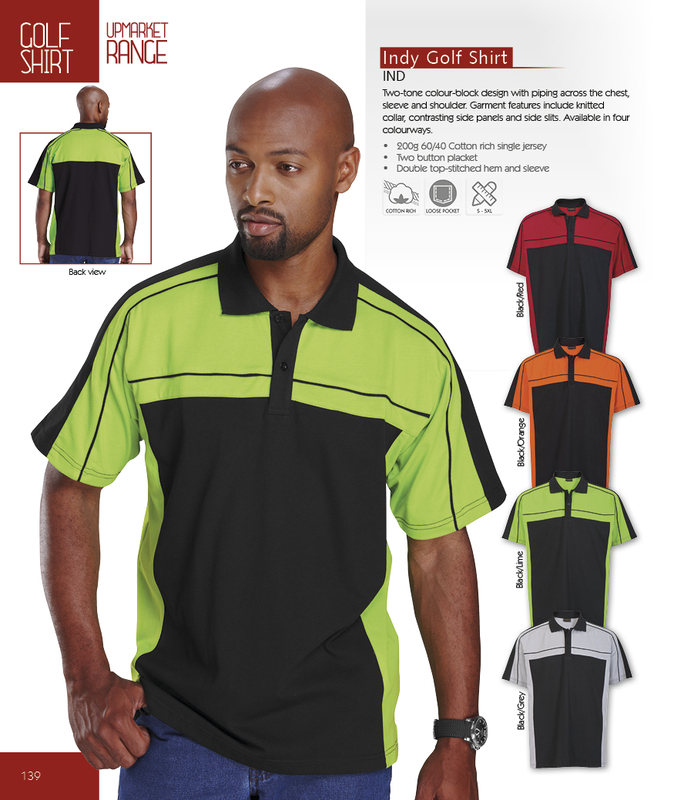 Pit-lane look golf shirt in three colourways with high-viz detailing. Contrast chest and shoulder inserts trimmed with reflective piping. Contrast taping on neck and side slits. 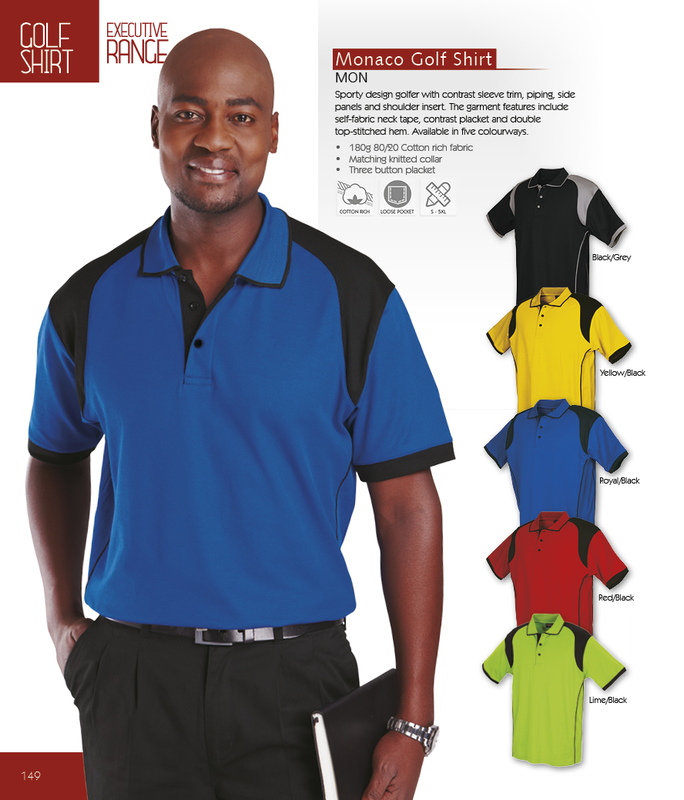 Two-tone colour-block golf shirt with piping across the chest, sleeve and shoulder. 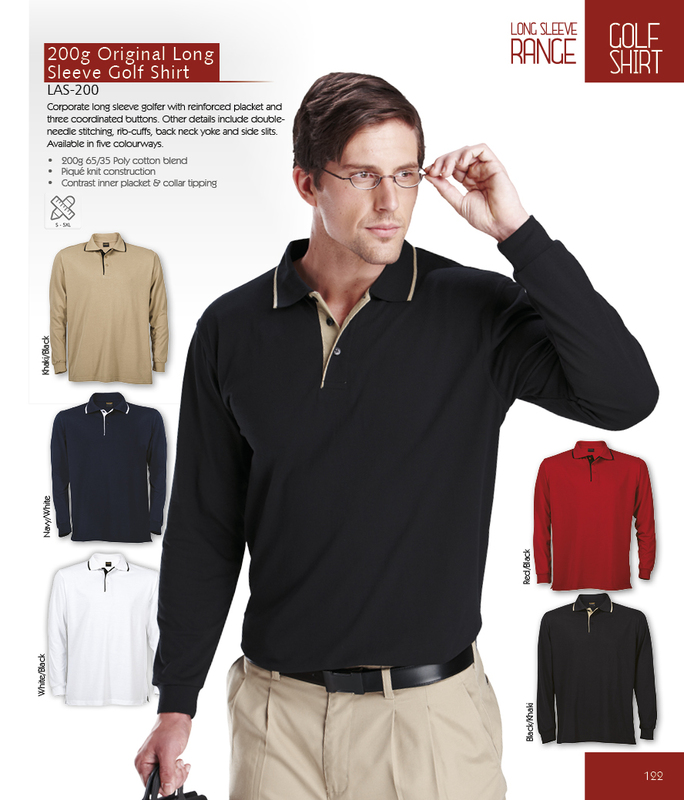 Golf shirt features include knitted collar, contrasting side panels and side slits. Available in four colourways. 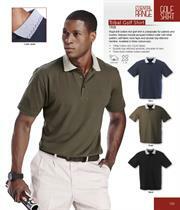 New melange piqué knit golf shirt featuring distinctive short two button laid-on constructed placket. 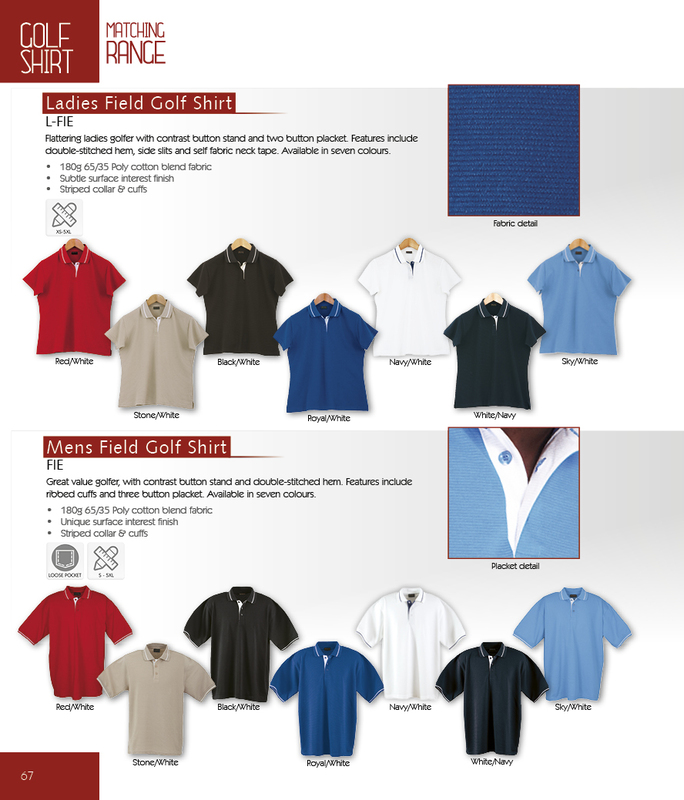 Golf shirt trims include knitted collar and cuffs, coordinated side slits and contrast collar tipping, buttons and neck tape. Available in five melange colourways. 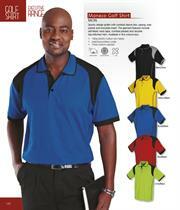 Raglan three tone golf shirt design with contrasting piping on the sleeves and side panels. The oval contract insert on the sleeve is an ideal branding position. Other features include a knitted contrast striped collar, self-fabric neck tape, finished off with a double top-stitched hem. New striking panel design golf shirt with raglan styling and contrast piping. Features include, self-fabric binding on cuffs, three button placket, contrast neck yoke and knitted collar with contrast tipping. Available in four colourways. Subtle yarn dyed stripe golf shirt with a jacquard knitted collar. Features include three button placket and solid colour fabric neck tape, placket and inner back yoke. 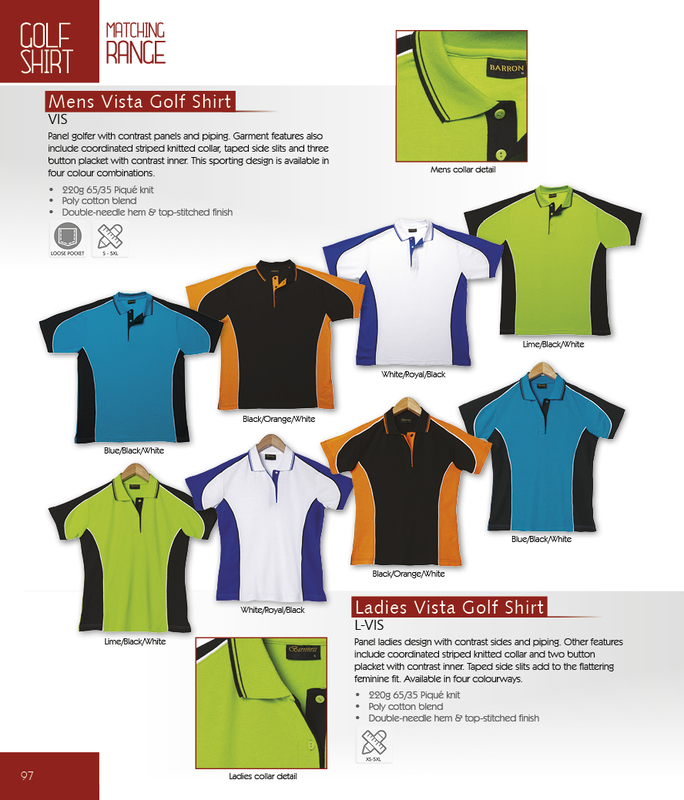 This golf shirt is available in four colourways. New golf shirt with fine stripe design for a more classic appearance. Other details include three button placket, side slits, top stitched armholes and self fabric neck tape. Available in four colour combinations. 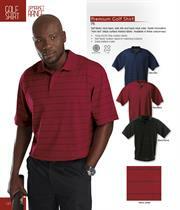 This trendy poly cotton twill knit golf shirt features a diagonal striped insert on collar stand and placket. Garment details include three tonal buttons on the concealed placket, sides slits has contrast tape with bar-tacking and single top-stitched shoulder and armhole. Available in three colours. 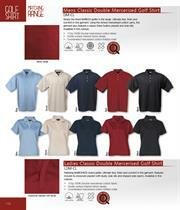 New executive moisture management golf shirt with subtle horizontal stripe design and plain fitted sleeves. The garment features a knitted collar, three contrast button placket and side slit with double contrast bar tacking. Available in five colourways. 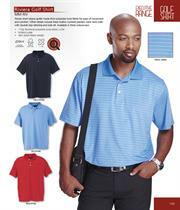 Classic country club and corporate look golf shirt. 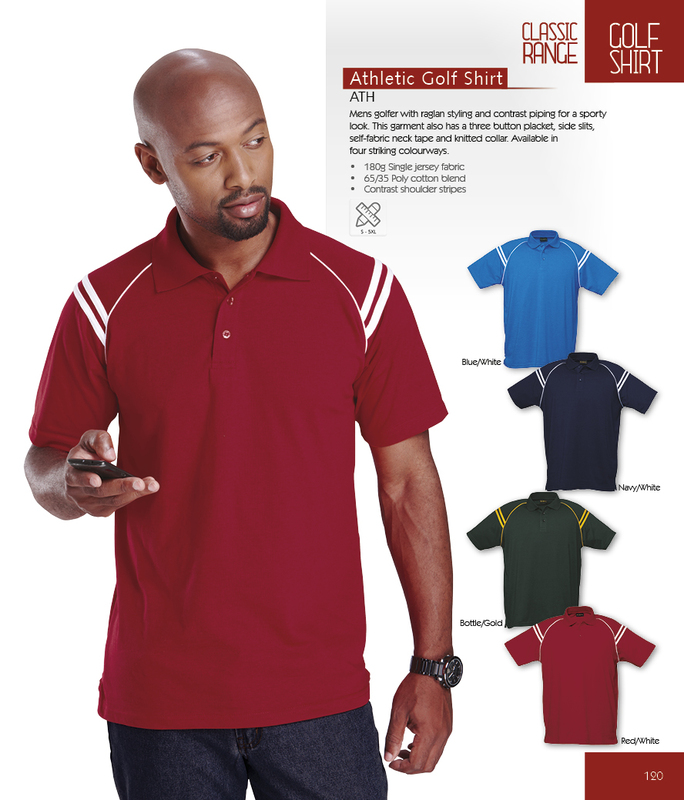 Matching collar with self-fabric neck tape to add to the garment's durability. Double-stitched hem and sleeves. Reinforced placket with matching marble buttons. Available in three colourways. 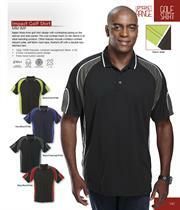 Sporty design golf shirt with contrast sleeve trim, piping, side panels and shoulder insert. 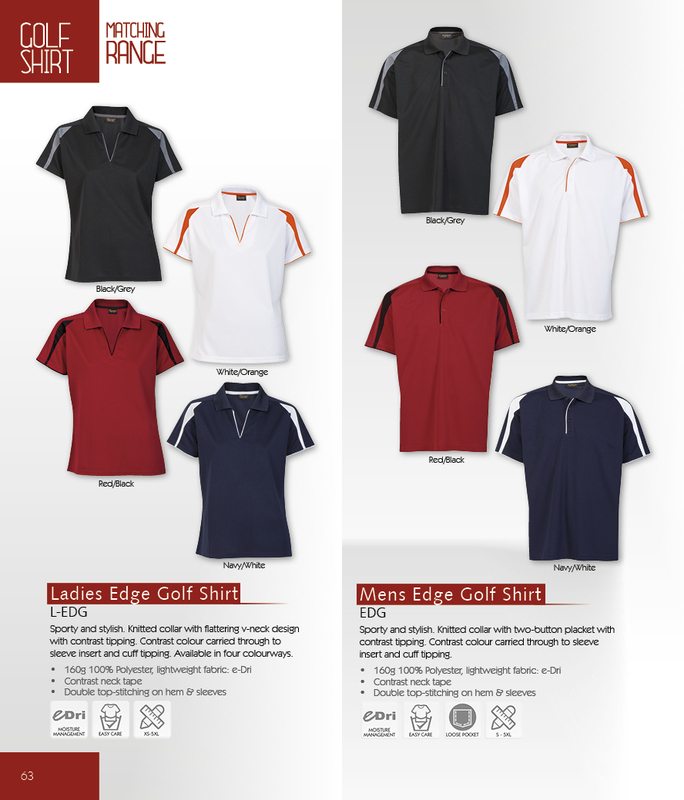 The golf shirt features include self fabric neck tape, contrast placket and double top-stitched hem. Available in five colourways. New trendy short sleeve golf shirt made from polyester lycra fabric for ease of movement and comfort. 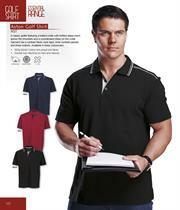 Other details include three button contrast placket, back neck yoke with double top-stitching and side slit. Available in three colourways. Style and durability in this fashionable golf shirt with two piece collar and contrast inner collar stand. Features tonal three button placket, side slits with contrast bar-tacking, knitted stripe collar and tri-stripe detail on button stand. Available in four colourways. 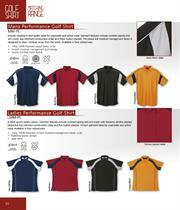 Easy-wear performance fabric golf shirt with fine surface interest block design. Trimmed with knitted collar, three tonal buttons, reflective piping in the inner neck and single top-stitching on the shoulder and armholes. Available in three colourways. 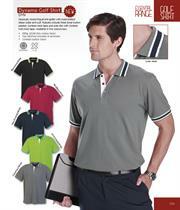 New classically styled golf shirt with knitted striped collar and cuffs. Golf shirt features a three button placket with tonal buttons, two-piece collar, side slits with contrast bar-tacking and contrast knitted button stand. Available in four colourways. 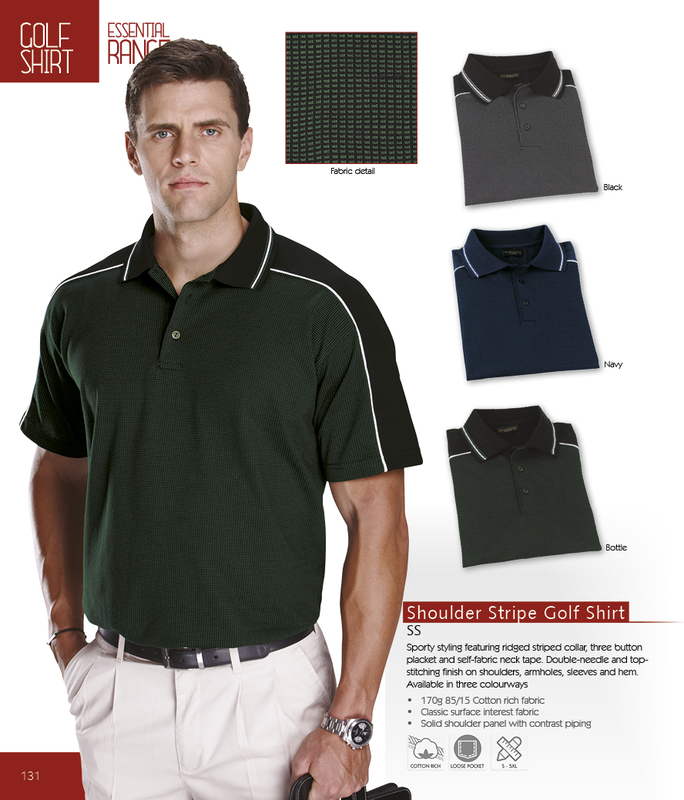 New classic golf shirt with stripe tape detailing on the inner placket and neck seam. 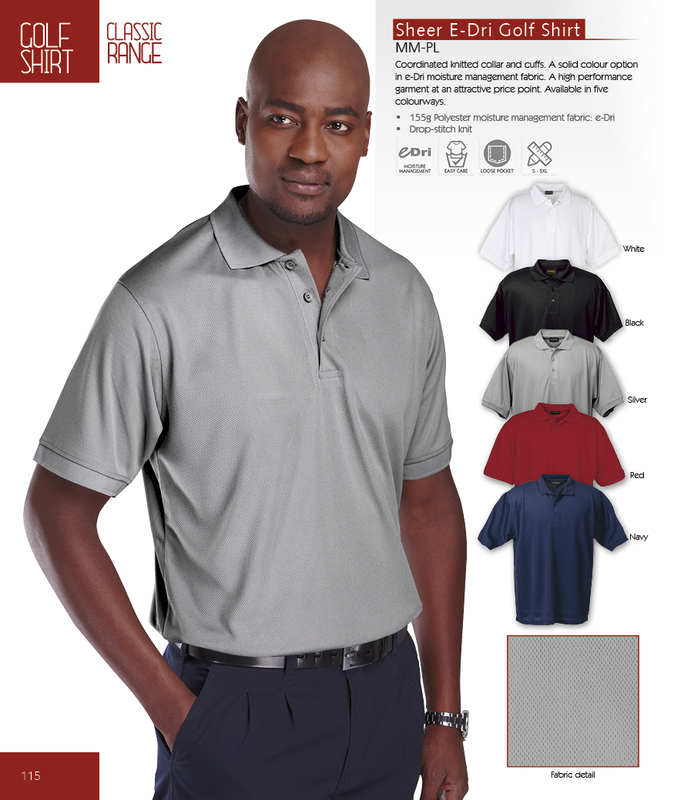 Golf shirt features include two piece collar, side slits with contrast bar-tacking, knitted collar and cuffs with contrast tipping and three button placket. Available in four colourways. 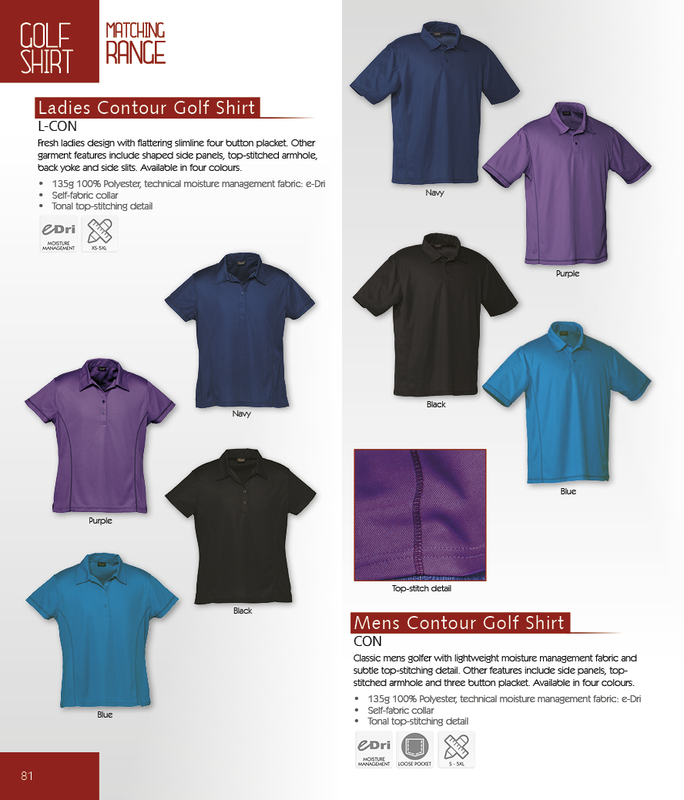 Comfort is guaranteed with this upmarket and exclusive surface argyle pattern design golf shirt and plain fitted sleeves. It has a knitted collar, self-fabric neck tape, three tonal button placket and single top-stitched armhole. Available in three colourways. 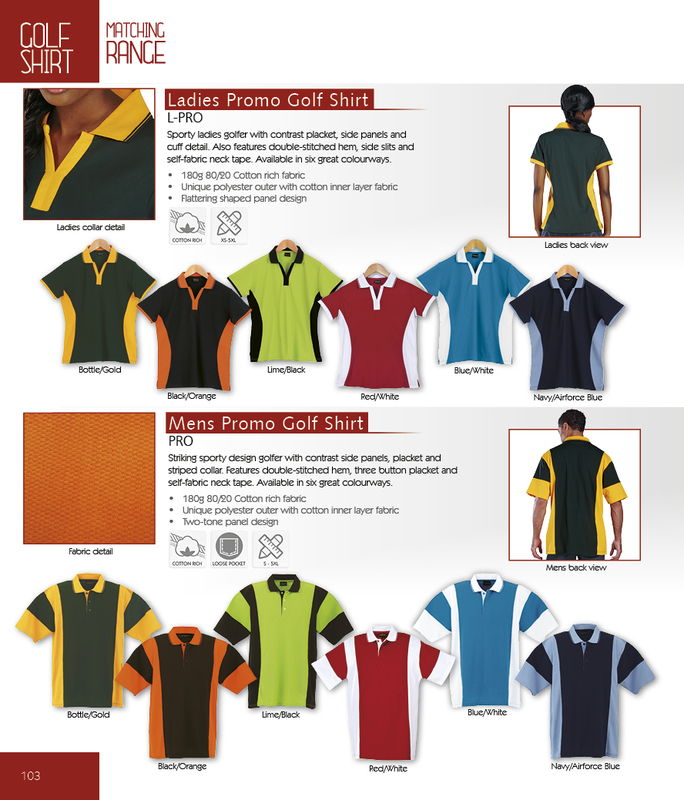 Golf Shirts - Striking promotional, corporate and sports golf shirts in vibrant colours and a huge variety of styles and colour combinations. Widest range, best quality and great value.